Our static caravan is perfectly situated in Saltburn, 2 mins from a picturesque woodland walk down to the sea and right beside the town. The beach is dog friendly, with a few restrictions during summer months. Our "Coastal" caravan has a very comfy double bedroom and two twin rooms and has been planned with families in mind; books, games, dvd, free-sat tv, beach equipment, beds are ready and made up (please just bring towels). Hazlegrove Caravan Park is a peaceful, well cared for site. Rabbits, hedgehogs and a wide variety of birds can be spotted in the evenings amongst the caravans against a backdrop of the sea and the wind through the trees..a little haven of calm. Saltburn-by-the-Sea is a charming resort retaining many features from the Victorian era; the beautiful and celebrated pier, Britain's oldest water balanced cliff lift and formal Italian gardens linked to the shore by a miniature railway. All this plus stunning coastal walks with panoramic views that have inspired the thriving local art scene. We are a family of 5, including 3 young children. We have family ties to the area and have always loved it. We have taken the opportunity to buy a seaside bolt-hole that we can enjoy ourselves and rent out to others. 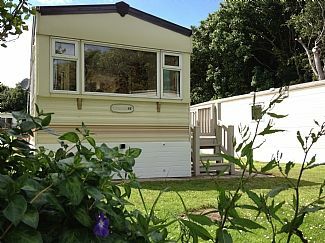 We have recently acquired another 2 bed caravan "Seaview" which is a stone's throw from "Coastal", sleeping 4. Perfect for those wishing to stay away with friends or family. "Seaview" also has a washing machine which is very handy! We love being by the sea, it's an affordable way to enjoy a relaxed family break. Caravans appealed to our kids when they were younger, feels cosy, relaxed and there's not too much space to keep tidy! The decking outside is nice for a glass of wine while the kids are in bed or watching TV in the living room (still enough areas to get a break from each other when needed whilst always being close by). It's just so conveniently situated for the beach andvictorian seaside town of Saltburn. One of us can be walking the dogs on the beach with the kids, whilst the other is walking around the Saltburn checking out the every growing number of lovely shops or buying dinner. Perfect! Lots of nice cafes, restaurants and bars nearby. Guests receive a 15% discount on full price beauty treatments at The Amber Rooms situated at The Spa Hotel Saltburn. www.thespahotelsaltburn.co.uk 01287 622544 (Quote CARAVAN) and Guests dining at the hotel for a 3 course meal also receive a free glass of wine or pint of beer on the house. Just quote "CARAVAN". Bathroom with shower cubicle, sink and toilet accessed from corridor. Large sofa area seating 6 comfortably. Free-sat TV with DVD facility, Ipod and dock/radio.Range of DVD available to use. Gas fire/oil heaters. Wifi dongle. Under sofa storage with games in for kids. Cooker, hob, microwave, Coffee machine, Toaster, fridge/freezer, ipod dock. The surrounding areas offer a range of stunning golf courses including: Saltburn-by-the-Sea Golf Club; located on the outskirts of Saltburn, 1 mile from the caravan site. Special features of the course are the magnificent views out to sea and inland to the North Yorkshire National Park and the famous Roseberry Topping. Hunley Hall Golf Club; a luxury golf resort 3 miles from Saltburn offering 4 courses to test a range of abilities. Cleveland Golf Club; just 6 miles down the coast and a true seaside links. It is also the oldest course in the county of Yorkshire. Notes on accommodation: Dogs are welcome and the site is very dog friendly; we have a large dog bed, food/water bowels and leads available for use, upon request. Guests receive a 15% discount on full price Decléor massage and facial treatments at The Amber Rooms. www.thespahotelsaltburn.co.uk 01287 622544 (Quote CARAVAN) Outside: Outside decking area has table and chairs and is gated, allowing young children or dogs to walk outside, safely, when kitchen or living room doors are open. Cleaning / Linen : All bedding provided and beds made up for your arrival-Please bring your own towels. Other: High-chair available on request. Parking is available in bays on the lane that runs through the site. There are no dedicated spots but there are always available bays and are no more than a 2 minute walk from our caravan. 8 miles of stunning, sandy, clean beaches with surfing voted in the top 10 surfing destinations in the country. A 5 minute walk through the woods to the beach and pier, offering beach side shops, fishing, surf hire, toilet facilities, amazing fish and chip shop, cafes/pubs and the historic cliff lift. Durham Tees Valley airport is the nearest. Newcastle and Leeds/Bradford airports are the next ones close by. Saltburn has a train station, running to Middlesborough and Darlington. York, Middlesborough, Darlington and Northallerton are the nearest major train stations. Easily accessible, by car, from the A19 which is Junction 49 of the A1m. The accommodation includes a folder with detailed information about the property and the surrounding areas, dates of local events and farmer's markets. Saltburn itself is well known for it's superb surfing, beautiful coastline and easy access to coastal walks. The file provides suggestions of the best place for a Sunday roast, where to go for fish and chips, local art/music/comedy events, where to go on a scorching day and where to go when it's tipping it down. There are endless places to visit, including the unmissable Robin Hood's Bay, Sandsend, Runswick Bay and brilliant rock-pools at Staithes. Explore the wild North Yorkshire moors too and a trip to Beamish and Durham castle always provides a great day out. There are some great local websites detailing great fishing trip days out with the kids, many yearly events such as the folk festival, Goth festival, Redcar races which can help you plan your stay-just ask us for details.